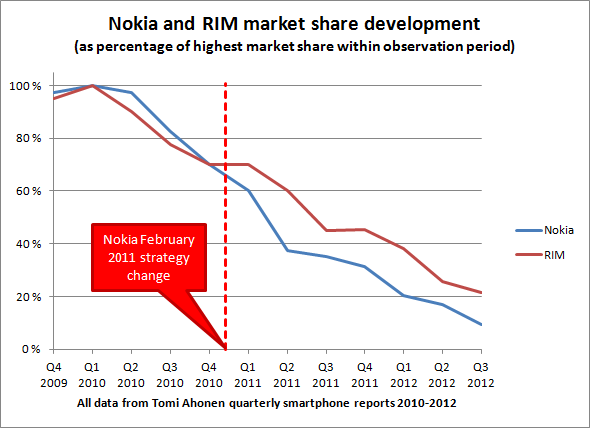 It seems RIM’s attempt to get out of the funk was the Black­Berry 10 OS which hasn’t really worked out too well for them. Nokia on the other hand seemed to take a dif­fer­ent strat­egy, real­is­ing their ancient Sym­bian OS was a pile of dung they decided to do a an about-face and join with Microsoft and move all their phones onto Win­dows. Ear­lier this year this move was com­pleted and the last Sym­bian device shipped was in mid-2012. So basi­cally Nokia killed Sym­bian, cut all the costs out of its busi­ness from rolling it’s own OS and focused on Win­dows devices and prof­itabil­ity of the devices divi­sion which it has achieved. They even sold off their head­quar­ters and leased it back! And the goal of all this — to inflate the price of Nokia Devices so that they could make a strate­gic exit by sell­ing to Microsoft. This plan has clearly been in the mak­ing for a very long time and my hat goes off to what I think is a genius move by Nokia to offload a strug­gling divi­sion that once defined the com­pany so that they can once again rein­vent them­selves — which given they are Finnish and have a lot of Sisu I’m sure they will do. Microsoft on the other hand have a lot of cash and I think this is a case where Balmer didn’t have much choice but to go along with this move, how­ever I don’t see a bright future for Win­dows phones — Microsoft needs to be in this mar­ket but they haven’t shown they under­stand it and they are too late in cre­at­ing an ecosys­tem. Maybe the next CEO of Microsoft will have a bit more insight and be able to take them some­where exciting?